McGraw-Hill Education's Connect is a digital assignment and assessment platform that strengthens the link between faculty, students, and coursework, helping everyone accomplish more in less time. For students, Connect uses innovative, interactive technology to enable a more personalized learning experience that better engages students in course content so they are better prepared, are more active in discussion, and achieve better results. Connect allows instructors to give homework assignments with immediate, automatic feedback, upload recorded class lectures and presentations through Tegrity, and track student progress and concept comprehension through robust reporting tools. Available within Connect, Concept Clips help students break down key themes and difficult concepts in Psychology. Using easy-to-understand analogies, visual cues, and stimulating animations, Concept Clips make Psychology meaningful to everyday life. Available withing Connect, Inter-activities allow students to experience an apply their understanding of psychology to the world with fun and stimulating activities. Available within Connect, Newsflash exercises tie current news stories to key psychological principles and learning objective and assess students on their ability to make the connection between real life and research findings. Connect Insight is a one-of-kind visual analytics dashboard—now available for both instructors and students—that provides at-a-glance information regard¬ing student performance. Designed for mobile devices, Connect Insight travels from office to classroom, available on demand wherever or whenever it’s needed. 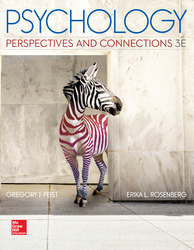 Challenge Your Assumptions - Psychology: Perspectives and Connections helps students understand the path to discovery by challenging their assumptions and moving beyond "black and white" thinking. With this in mind, each chapter begins with Challenge Your Assumptions. Assertions such as "Pulling an all-nighter is a good way to study for an exam," or "Eyewitness memories are usually accurate," prompt students to question their own perspective and begin to understand the importance of thinking critically. Connections annotations appear throughout the text, reinforcing the interrelatedness of subfields of psychology. The Research Process feature demystifies research by providing a step-by-step, visual approach to the scientific method. Students are presented with the basic structure of a contemporary study, walking through the "story" of how the research was conducted. In Chapter 3, for example, students are led through the methodology chosen by a researcher exploring whether different parts of the brain are responsible for imagining and seeing faces, versus only imagining. Two LMS Integration Services = One Solution. McGraw-Hill Higher Education offers two pathways for LMS integration. McGraw-Hill Education Campus enables seamless access from any LMS in use to all of our content and learning platforms. Blackboard Learn customers may also leverage the McGraw-Hill Education Connect building block specific to their LMS for the tightest integration available today for Connect users. Gregory Feist (Ph.D. University of California, Berkeley) is Associate Professor of Psychology in Adult Development at San Jose State University. Dr. Feist is widely published in the psychology of creativity, the psychology of science, and the development of scientific talent. One of his major goals is establishing the psychology of science as a healthy and independent study of science, along the lines of the history, philosophy, and sociology of science. His teaching efforts have been recognized by outstanding teaching awards at both the University of California, Davis and the University of California, Berkeley. Erika Rosenberg (Ph.D. University of California, San Francisco) served on the faculties at the University of Delaware and the College of William and Mary and currently is a researcher at the Center for Mind and Brain at the University of California, Davis. Dr. Rosenberg is an emotions researcher, health psychologist, and teacher of meditation. Her research on emotion has examined how feelings are revealed in facial expressions, how social factors influence emotional signals, and how anger affects cardiovascular health. Her current research interests include collaborative studies that integrate Western psychology with Buddhist practices for improving emotional and cognitive functioning.